January 2017 sees the next generation Freightliner Cascadia take to the roads in North America. This follows a $300 million investment, the work of 800 engineers and five years of R&D, according to Daimler AG. The company says the new Cascadia “sets even higher standards in connectivity, fuel efficiency and safety technologies” when it unveiled its new flagship in the heavy-duty Class 8 in Colorado Springs, Colorado this month. “Our new Freightliner is the most connected truck we have ever built. It proves the consistent way in which the technology strategy of Freightliner has developed in the U.S. Already today, more than 180,000 of our trucks in North America are online. With our new Cascadia this number will increase dramatically”, said Dr. Wolfgang Bernhard, member of the Daimler AG board responsible for trucks and buses. 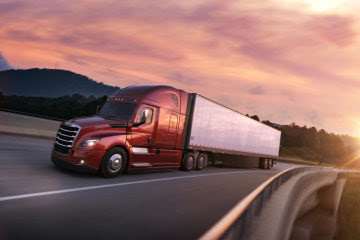 With over 412,000 units sold since the launch of the first Cascadia in 2007, the unit is the best-selling Class 8 truck in the NAFTA region, according to Daimler. And with a market share (including Western Star) of about 43 percent, Daimler Trucks North America (DTNA) says it is the biggest truck producer in the US and Canada. Number two is Paccar with 27 per cent. Despite references to improved fuel efficiency, numbers were few on the ground in Colorado as company executives met the Press four months ahead of SOP (start of production). However Daum did say the new truck combines state-of-the-art electronics, advanced powertrain integration, new technologies and “refined aerodynamics to deliver up to an eight per cent improvement in fuel economy compared to the current Cascadia Evolution”. It will be interesting to see if the eight per cent can be achieved by operators on the ground. Daum seems convinced they will be able to. Certainly, when developing the new Cascadia, engineers set a priority goal of achieving significant fuel savings. “Our initial goal [in developing the New Cascadia] was five per cent, so the eight per cent we saw in testing was a mind boggling number,” Daum told reporters. Fresh, aerodynamic shape with dozens of sleek new updates and advanced powertrain components contributes to increased fuel efficiency by up to 8 percent over a 2016 Cascadia Evolution. One key benefit of the new Cascadia is the integrated powertrain. Daimler in particular is pushing hard for vertical integration. For, unlike in Europe, it is common in North America for commercial vehicle customers to specify third-party aggregates in their trucks, which helps engine makers like Cummins Inc. But for how long? Highlights then of the new truck and its integrated Detroit powertrain (with at least 400 bhp ratings) will be the DD15 (above) or DD13 diesel engines mated to the Detroit DT12 automated mechanical transmission and new Detroit rear axles with ratios as low as 2.16. 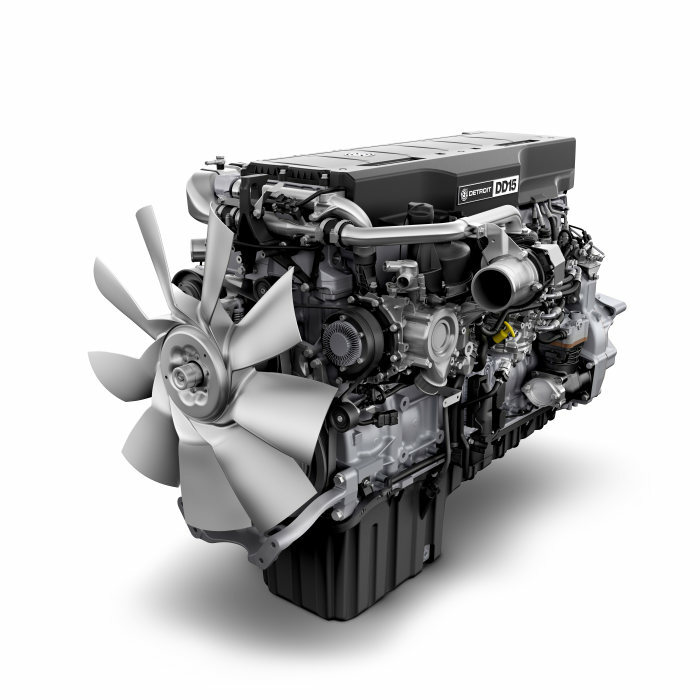 The DT12 receives several internal changes to reduce friction for better fuel efficiency as well as a new generation of Detroit’s intelligent powertrain management software that incorporates GPS-enabled predictive cruise control. New gear coatings and an electronic lubrication management system are among the fuel-efficiency features of the new Detroit tandem axle, which will initially be available with a 2.28 final drive ratio followed by the 2.16 ratio later in 2017. Using the company’s dedicated wind tunnel and computer fluid design, the New Cascadia’s cab has been fine-tuned for “optimal” aerodynamics, according to Kary Schaefer, general manager of product marketing and strategy. Initial production will begin in DTNA’s Cleveland, North Carolina, and Saltillo, Mexico, plants early next year, slowly building to full production by mid-2017. The current Cascadia Evolution, which will now be called the Classic Cascadia will also remain in production for at least two years, according to Daum. He adds that there is a 19 per cent spread in fuel efficiency between the base Classic Cascadia and the most efficient New Cascadia, offering customers a choice in cost and performance that meets their particular operations.